Nature have some amazing products to heal and take care of humans through different usage from which some are still hidden gems. I have yet to discover many of these treasures and Tamanu oil was one of them. 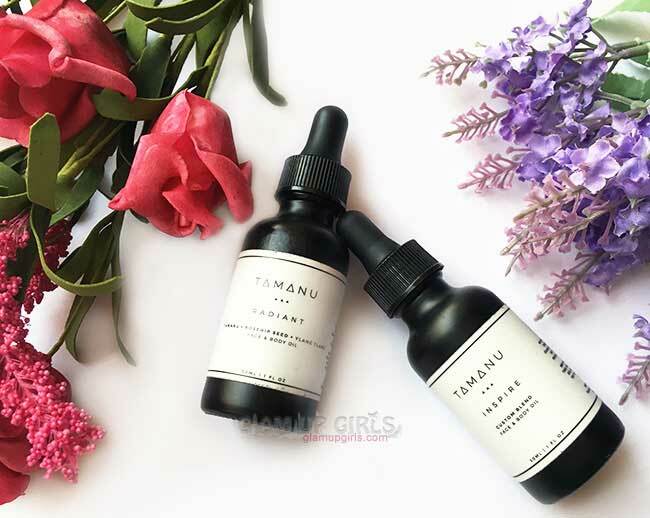 Tamanu oil is very rare, which is called the “Forgotten Medicinal Miracle.” It grows in a very small area in the South Pacific and is made from the nut of the Tamanu tree. Tamanu oil is quite difficult to make which is why it is difficult to find it locally. 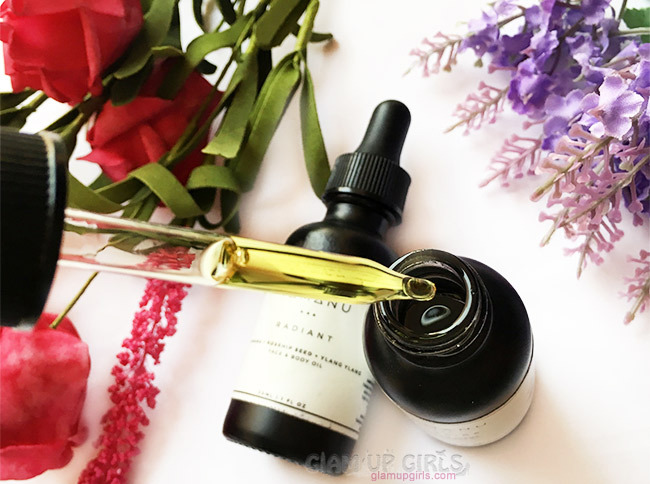 Tamanu oil lab sent me two of their blends having Tamanu oil as key ingredient which i was using regularly and today i am going to share my thoughts on these blends. Glam it up with this age-defying blend. Radiant is designed to fight fine lines, wrinkles, and acne, while promoting skin regeneration. Your skin will be glowing with this fast-absorbing, silky smooth blend, and even your soul might feel a little younger. Rosehip and ylang-ylang are calming oils that can soothe tense nerves, diminish headaches, and even help lift you out of a bad mood. These oils are also known for stimulating libido, so feel the love and confidence every time you apply! No one knows you…like you! Our Inspire blend lets you choose the essential oils and botanical oils that you want for your personalized skincare oil. It all starts with our Tamanu oil, and then you choose the rest from our menu of oil options. 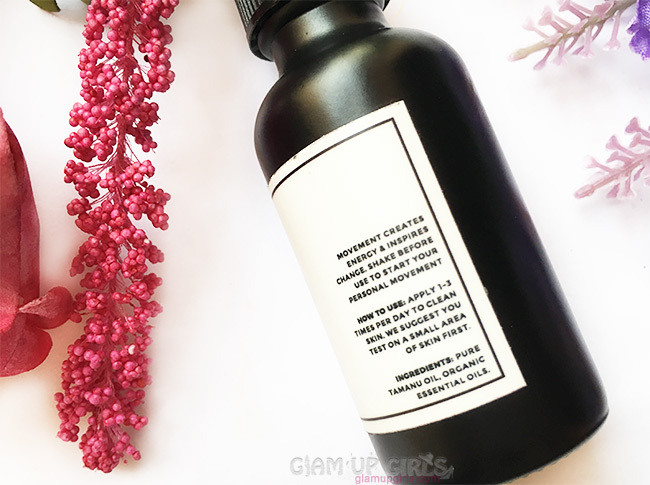 Tamanu blends comes in matte dark glass bottles which is perfect to secure the essence of essential oils. These bottles have dropper to easily dispense out the oil. I got to try two blends form the lab, their well known Radiant blend and one custom blend called Inspire blend. Both oils have light green color and strong scent of essential oils. The best way to use these oils is to shake them well and drop few drops of oil on palm and take a moment to breathe in the natural scent of oil before application. I have mostly used these oils at night after thoroughly cleaning my skin and messaging it slowly. This oil is light weight and not very greasy. I have noticed it absorb into the skin efficiently so having dry skin it is quite an amazing moisturizer. However due to extreme hot weather i am not using it in morning to be on safe side. The radiant blend which includes rosehip seed oil and ylang-ylang oil along with tamanu oil, is for dry skin to protect against fine lines, dullness and other issues while The inspire blend can be created on any ones instructions with their choice of essential, botanical oils along with tamanu oil for which you can choose the ratio or leave them to the expert team of Tamanu oil lab. I wanted to add lavender essential oil in my Inspire blend and left the rest of science on the lovely owner to choose for me. My Inspire blend includes essential oils of lavender, rosemary and geranium rose and botanical oil of pumpkin seed. This blend is supposed to be empowering, healing and nourishing, both physically and spiritually. I like to use these oils alternatively and specially when i am tired i love using my Inspire blend. If you are some one who cherish the natural products without a hint of artificial product, even scent or color then you are going to find these blends perfect for you. Their aromatic scent is very soothing, calming and relaxing. Not to forget i find these blends have seriously improved my skin texture and while i always suffer from the dryness even in hot weather these blends are savior. My skin feels more healthy and smooth while it also lighten the discoloration around my mouth due to dryness. They are not very oily and provide enough moisture to skin but i would highly suggest to cleanse your skin regularly to be safe from clogged pores causing any break out. I also noticed that the price for pure natural oil is very reasonable for quantity you get comparing to other brands who can put hole in your wallet for very little quantity and this point gave it an extra plus. 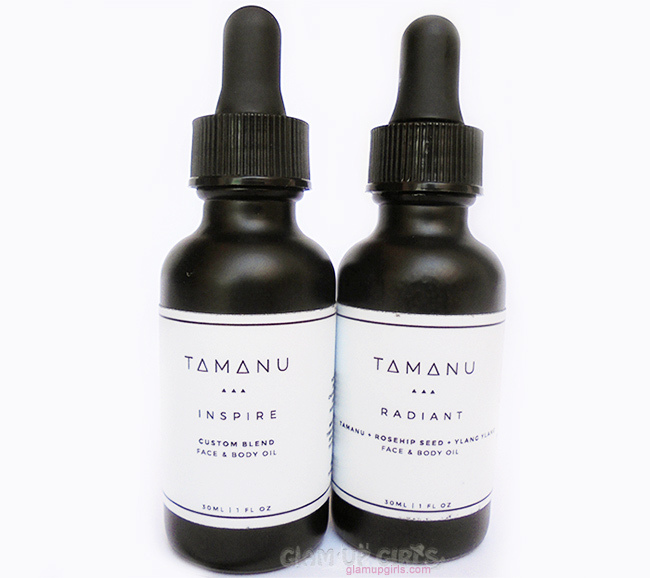 Tamanu oil lab Radiant blend is priced $32 (30ml) and Inspire blend is priced $28 (30ml). You can get 5% off with code glamupgirls on purchasing any blend. Caution: Essential oils can cause irritation/redness on sensitive or allergic skins and should be discontinued.